Bet you all thought that I was finished with my BookBin backlog, didn’t you? Well, this is the last one. Then it’s back to (hopefully) writing the review once I finish the book. This was another Borders bargain bin purchase, made a little more than a year ago. It was in the same book binge purchase as The Beautiful Cigar Girl as well as a few other books that are at the moment resting at the top of my nearest stack. Of course, my reading whims can be quite capricious, so who knows if I’ll get to them with the same haste as these two novels. I do loves me anything that feeds my Anglophilial obsessions, so when I flipped this book over and read the description, I thought it sounded like something right up my alley. 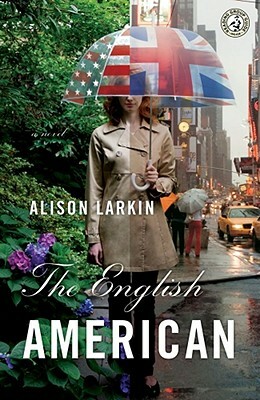 Written by Alison Larkin, The English American is a fictional/autobiographical hybrid of Larkin’s experience as an American-born baby adopted by an English couple, and who decides as an adult that she wishes to find her birth parents. Larkin has performed a comedy routine of the same name for several years, in which she recounts her own journey of discovery involving her birth parents over on this side of the pond. For this book, however, Larkin decided to turn her tale into fictional one in which readers follow the oftentimes parallel path of discovery walked by Larkin’s protagonist, Pippa Dunn. Pippa Dunn? Can you imagine a more English sounding name? Maybe something like Brixton Uxbridge, III…that might be more English sounding. And, yes, those are indeed names of two Tube stops. Do mind the gap. I suspect that this book might resonate rather strongly with anyone who was adopted and has gone through similar experiences. I did find interesting the many aspects of Pippa’s dealings with red tape and kerfuffle when trying to track down the identities of her birth parents. It’s amazing how many loopholes one must crawl through just to learn the simple truth of who they really are. However, the story itself was a trifle bit too…chick-lit for my preference. True, I’ve only read a handful of books that could qualify as fringe members at best of this particular genre, but I always find that when characters start to fall into the familiar patterns of uncertainty, neediness, and exorbitant personal over-analysis that seem intrinsic to this particular form of storytelling, my interest switch is immediately flipped into the “off” position. Throw in the tired subplot of the man she wants who is unattainable versus the man who wants her but is invisible to her because she’s focused so solely on the unattainable douchebag? You’ve completely lost my attention…which, sadly, this book did on several occasions. True, there are interesting elements that one normally does not find in chick-lit (I’m assuming…most chick-lit books don’t deal with first-time interactions with birth parents, correct? ), but it far too often felt too true to a formulaic style of storytelling that simply does not appeal to me. Final Verdict: Time to release The English American to prettier pastures. It was a lovely read at times but the chick-lit factor greatly surpassed all other aspects in my mind.